These criminals thought they could get away from the police so they tried to run. That's when things got really crazy. It started with a home burglary in Cerritos and ended in South LA, where the suspects pulled over on a residential street and took selfies with onlookers until sheriff's deputies showed up and peacefully arrested them. 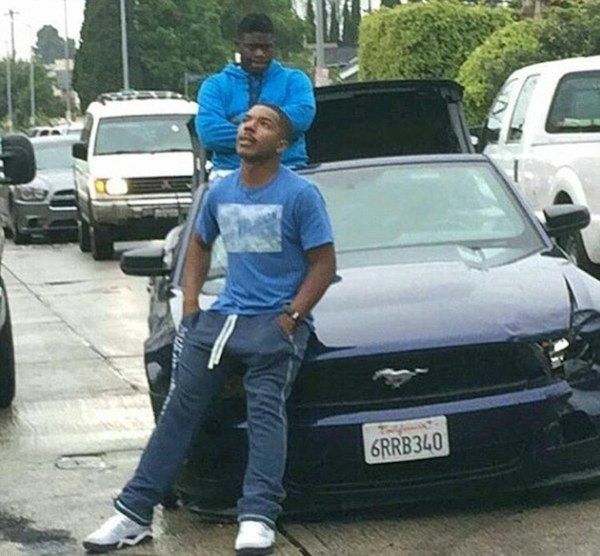 Passenger Isaiah Young, 19, and the driver, Herschel Reynolds, 20, taunted police and CHP officers, often driving on the wrong side of the road, doing 360-degree spins on Hollywood Boulevard, fishtailing on dangerously wet streets, and standing up and looking around at the helicopters overhead. A TMZ tour bus even tried to block the car as it drove on the 101 Freeway. 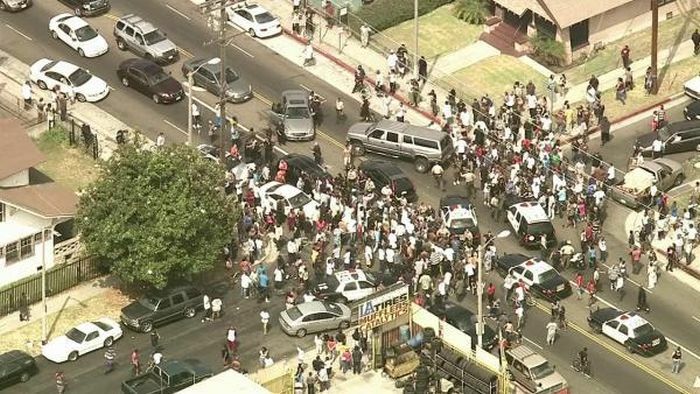 When the men finally pulled over in South LA, ending the chase, they were swarmed by crowds with cellphone cameras. Reynolds served in the Marines as a trained vehicle operator, the Pentagon confirmed. He is being held in lieu of $50,000 bail. Young is being held in lieu of $80,000 bail due to an outstanding warrant. 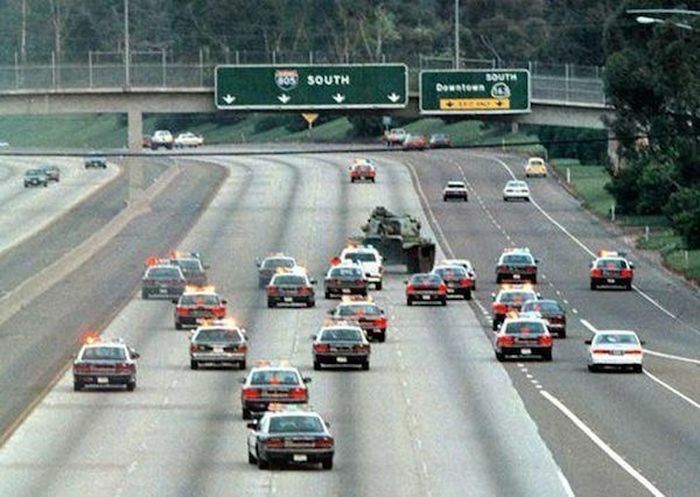 On May 17, 1995, Shawn Nelson stole a 63-ton military tank from a National Guard armory in San Diego and used it to rampage through neighborhoods, only to be fatally shot by a police officer. His former wife, Suzy Hellman, blames Nelson's behavior on methamphetamine use as his life spiraled out of control. Nelson's parents had died by the early '90s, which caused his behavior to become impulsive. Hellman filed for divorce from him at around the same time, and, that very same year, he got into a motorcycle accident and injured his back. Shortly after that, Nelson's van and work tools were stolen, his utilities were shut off because he didn't pay the bills, and he was frequently high. When the bank began foreclosure proceedings on his house, he dug a 17-foot-deep shaft in his backyard and claimed to friends that he had struck gold. But it was a delusion—there was only the dirt below. Nelson finally hit rock bottom and found a way through an open gate at the armory at Mesa College Drive where he stole the M-60. He flattened utility poles, fire hydrants and cars with the tank before getting stuck on a road divider. Later, he was fatally shot by police. In 2009, 56-year-old Joe Moshe was suspected of making a threat against the White House. He led police on a chase from Westchester to West Los Angeles then holed up inside a car near the Westwood federal building for nearly nine hours, prompting the evacuation of a nearby apartment building. When Moshe refused to get out of the car, police fired a "chemical agent" into the vehicle through a hole that was broken in the rear passenger-side window, but he remained inside. At least TWO more canisters were thrown into the car, but Moshe continued to stay put before cops forcibly removed him. In 2015, a bizarre slow-speed chase ended peacefully when a pedestrian stepped into traffic forcing the driver to surrender. 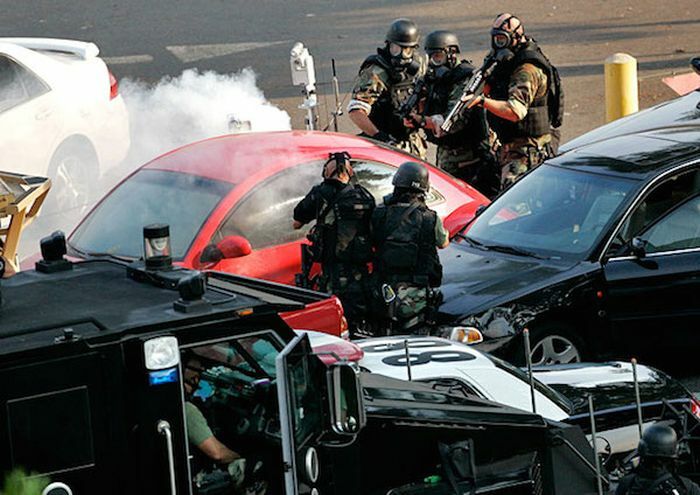 A man in a Ford Mustang had a sign on the driver's side door that read "Victory Parade" as he led police on a ten mph pursuit in the western San Fernando Valley. 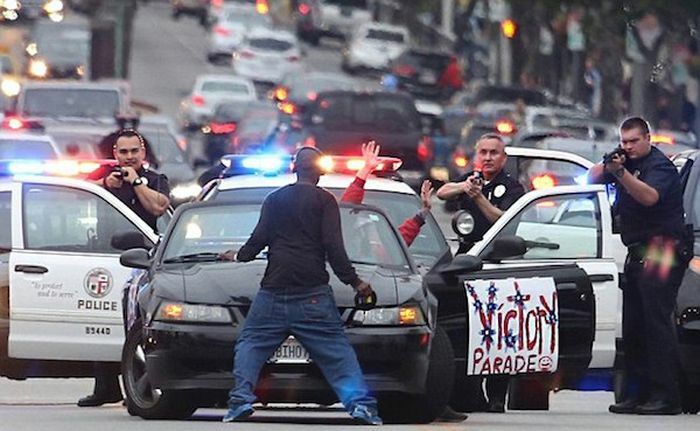 He flashed victory signs and waved and saluted at bystanders on sidewalks as he wove in and out of traffic while police followed along Ventura Boulevard. The pursuit ended when an onlooker stepped into the path of the car. The driver came out with his hands up. He faces a misdemeanor charge of evading arrest. Police said he has a history of mental illness, and they believe he was having a "crisis." 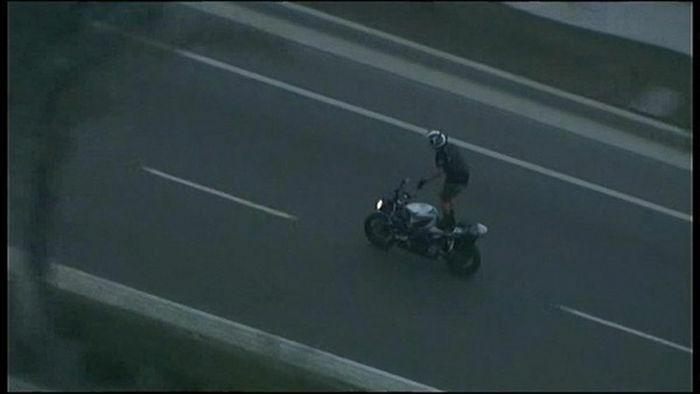 The man who stopped the chase was detained by police, but later released. A pair of bank robbery suspects led cops on a bizarre, dangerous pursuit, hurling fistfuls of stolen cash from their car in a failed getaway bid in 2012. Hundreds of people scrambled into the path of oncoming police cars as they lunged after the flying bills. In a move meant to slow their pursuers, their decision to share the loot in such brazen fashion made them instant heroes to many in the impoverished South LA neighborhoods where the chase came to an end. 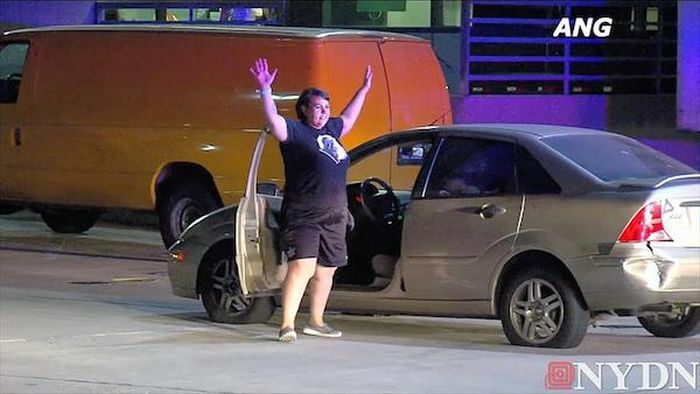 25-year-old Kelsey Wood stole a car and led police on a chase through downtown LA, before getting out of her vehicle to dance for the swath of officers waiting to take her into custody. The chase was on after Wood failed to yield to police while driving erratically in August 2015. She had sped for about two miles before she hit spike strips, forcing her car to stop as smoke spewed from the blown tires. When she emerged from the vehicle, she threw her hands up in the air—not in surrender, but in dance. Wood swayed her arms, popped her shirt, gyrated and spun around before getting back in the driver's seat, where she continued to get her groove on as the car stereo blasted "Where Ya At" by Future (featuring Drake). Wood was later charged with evading police and driving a stolen vehicle. In April 2016, Pasadena resident Simone Gonzalez, 32, allegedly tried to run over her parents and then led multiple law enforcement agencies on a high-speed chase that stretched from Pasadena to Thousand Oaks and finally ended in downtown LA. She was thought to have topped 100 mph on the freeways. When cops nabbed Gonzalez and asked why she fled, her response was incoherent. "I am a trained policeman," she said. "You are a legal slave trader." Gonzalez is currently behind bars back in Pasadena. 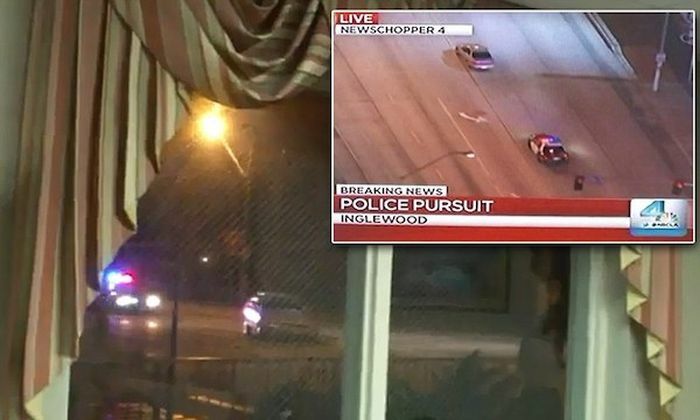 Inglewood resident Jason Lee got a surprise front-row seat to a police chase in 2013, when officers pursuing a motorist in a stolen vehicle turned a corner outside his house. Lee happened to be watching the chase unfold on TV at the time, and captured the humorous juxtaposition on tape. 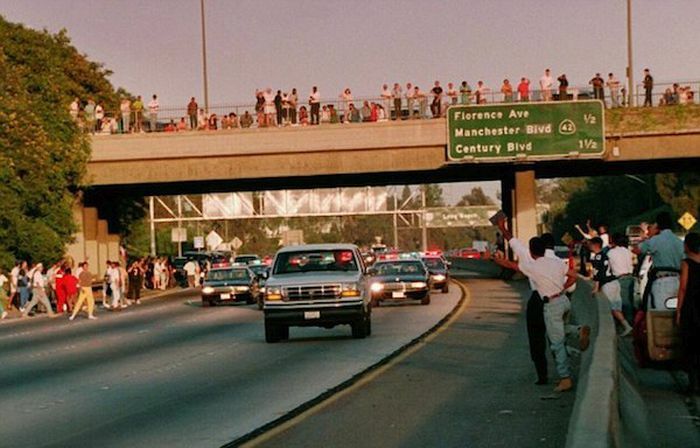 On June 17, 1994, television networks and cable news channels aired non-stop coverage of perhaps the most famous car chase to have ever taken place on LA freeways—O.J. Simpson in a white Ford Bronco. As California Highway Patrol and the LAPD tailed the Bronco, onlookers cheered and waved from overpasses and ramps during the chase—some even pulled over and got out of their vehicles to wave from the roadside. The chase began after Simpson was charged with killing his ex-wife, Nicole Brown Simpson, and her friend, Ronald Goldman. Simpson's friend and former Buffalo Bills teammate, Al Cowlings, drove the Bronco as Simpson hid in the rear, taking the chase that played out mostly on the 405 Freeway into the history books. The chase ended at Simpson's Brentwood mansion. He stayed inside the Bronco for another hour before being coaxed out by LAPD's Special Weapons and Tactics team. He was then transported by police motorcade to Parker Center for booking and transported to Men's Central Jail. Cowlings was booked on suspicion of harboring a fugitive. A motorcyclist taunted officers with his high-speed antics during an hourlong pursuit through two Southern California counties in May 2015. The suspect, Phillip Resendez, reached speeds of over 100 mph and ran several red lights. At one point, he even climbed onto the seat and took his hands off in a high-speed stunt. Resendez, 22, of Rancho Cucamonga was later booked for driving on the wrong side of the road and failure to yield. Some of The Most Stupid People in the World?